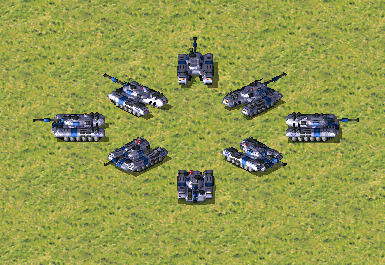 It seems that the tank is a little flat, when you compare its width with its height. 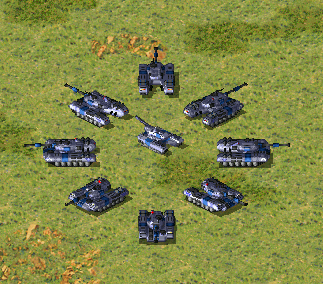 Also, dont use HVA position to adjust the turret's Z-axel position, as the rotation center is dicided by VXL Bounds, you should change that one, or it will behave wierd when this unit rotates its turret. Lighten the top so it doesn't turn into a dark mass the moment the turret isn't sideways to the sun. Yeah, IDK how to do that. The VXL Bounds i mean. RobyRulz, we appreciate your contribution here, but please, help the organization of the forums. - One voxel or voxel pack per post, please. So, when the visitor opens the forum, he will know exactly the amount of voxels we have and how to get it. A topic named "Voxels" isn't helpful at all to figure out what kind of voxels can be downloaded. This is why I've renamed it and split the car and Allied Black Hawk from this topic.